You guessed it the prize was in playing the game, with no lobbing and lots of laughter. The one twist that caught everyone by surprise: You never played with your spouse, you only played against them--the goal was stated early "everyone goes home with the person they came with"!! Fun time was had by all!! 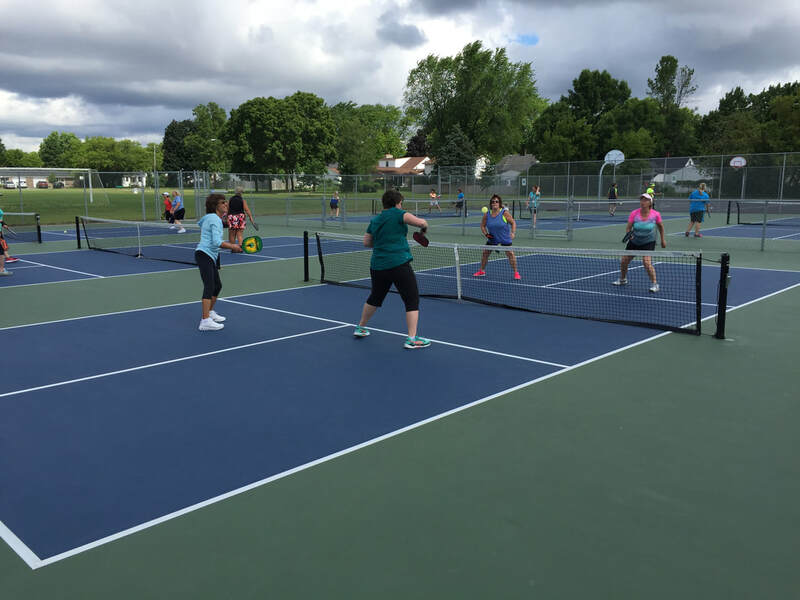 February 15th, 2019 brought out a group of PPP "newbies" to pickleball tournaments and from the smiling faces and hoots and hollers, it appears a great time was had by everyone! Both a men's and women's round robin produced some fantastic games, great volleys and excitement that convinced many to look toward the next tournament!! ​SOME ACTION PACKED SUPER SENIOR PLAY!! What better way to start off the New Year than to participate in an indoor Pickleball Tournament at The Kroc Center in Green Bay! Forty eight players participated in an all day "Picklebrawl" with 24 men & 24 women broken into two brackets, advanced & intermediate. With a crowd of onlookers cheering on their favorite player and just about everyone else who was playing, the all day event gave everyone some great exercise, fantastic competition and loads of fun!! Now all we need is a family tournament and Ray & Joanie are all set with their grandkids and matching paddles! !